This means, you have to have two viewports with a leftcamera and a rightcamera open. Expanding a single viewport will be destructive. Viewport with index 1 should be left, and index 2 right. I would advise to also have a perpective viewport opened. The stereocam has a handy preset for this purpose: 2 cams + persp (bottom). Make sure that both viewport look the same. One viewport in wireframe and the other one smooth shaded will be unpleasant 3d. Also set the the transparancy to an equal setting (none, simple or best). Der Beitrag wurde am Samstag, den 7. August 2010 um 11:23 Uhr veröffentlicht und wurde unter main abgelegt. Du kannst die Kommentare zu diesen Eintrag durch den RSS 2.0 Feed verfolgen. Kommentare sind derzeit geschlossen, aber Du kannst dennoch einen Trackback auf deiner Seite einrichten. a quick introduction on how to get it started! 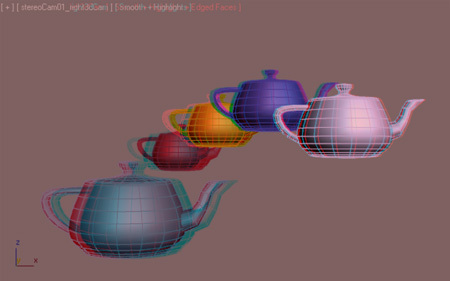 btw: I\’ve opened a facebook site called \"S3D – stereoscopic 3D\" where we could discuss about creating standards, share tutorials and connect to other people interested in S3D.